The business operates in 1,700 square feet. There is ample parking, lighting, and a security system. Rent with CAM is $2,335 per month. This business is a coin operated laundromat located in a Southern Suburb of the Twin Cities. The current owner has kept a clean and well-maintained store with updated machines and a loyal customer base. There are 10 double-stack dryers 3 single 75lb high capacity dryers. There are 19 high capacity front load washers and 10 top load washers. 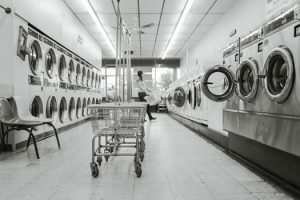 The laundromat is located in a high traffic strip center with ample parking. There is very little competition in the area. The current owner generally stops by the store a couple times a week to check on the machines and empty quarters into the bill changers. The barrier of entry for competition is high with the cost of build-out, equipment, and upfront . SWAC fees. This entry was posted on February 28, 2018 by Mac Thelen.